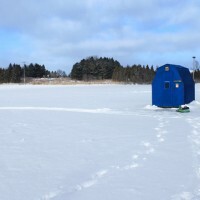 When the temperatures drop below freezing, ice fishing become the most popular activity at Island Lake Conservation Area! The season begins after January 1 annually, when 7 inches of ice has formed on the lake. All visitors must pay regular area admission fees. * Prices do not include HST. ** Minimum 2 adults per 4-man hut on weekends and holidays, children 14 and under are not required to pay a hut rental fee as long as minimum hut occupancies are met. Holes will be pre-drilled based on how many people fit. Extra holes available for an additional cost. Minnows available at an additional charge. Reservations are recommended for weekends and holidays. A $2 non-refundable reservation fee (per person) and credit card number are required. Please call 1-800-367-0890 between 8:00 am and 6:00 pm or book online here. Phone cancellations can be taken at 1-800-367-0890 up to reservation time and receive a full refund minus the reservation fee ($1.77 plus HST per person). No refunds will be permitted for “no shows” or cancellation during or after reservation time. Snowmobiles ATV’s and other motorized vehicles are not permitted on the ice or in the Conservation Area. Fishing licenses are required and are not available for purchase on site.